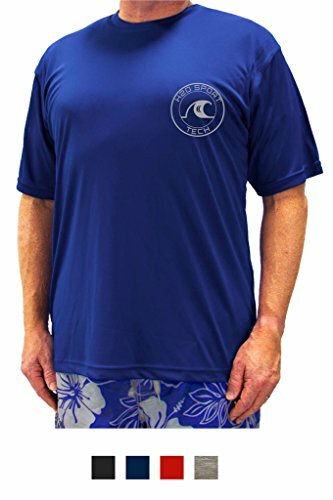 Big & Tall Men's Loose-Fitting Short-Sleeve Swim Shirt with sun protection of UPF 50+, for all your activities, in or out of the water. Brand: H2O Sport Tech - exclusive brand of Best Buys Big & Tall. If your shirt does not have the same logo as depicted in the photos, it will not have the same fit or quality of the item description in this listing. Tightly woven 100% polyester fabric quickly wicks moisture and provides UV protection. Fabric has a slight sheen to its appearance (except the gray heather color). Ribbed neckline with reinforced taping. "H2O SPORT TECH" logo screenprinted on left chest. Tagless. Machine washable. Enlarge photos for detail. TRADEMARKED PRODUCT. H2O Sport Tech is the exclusive brand of Best Buys Big & Tall. The shirt you receive must have this brand printed as the neck label. Your order will also include a handwritten note. BEWARE: If your order is from any other seller, it is not authentic, low quality, and will not fit properly. EXCLUSIVE FOR BIG & TALL: Loose-Fitting Short-Sleeve Swim Shirt with sun protection of UPF 50+, for all your activities, in or out of the water. Full cut, loose fit, RUNS LARGE, and properly sized for big and tall men - larger in chest and longer length. KEEPS YOU COOL: Tightly woven 100% polyester fabric quickly wicks moisture and provides UV protection. Fabric has a slight sheen to its appearance (except the gray heather color). "H2O SPORT TECH" logo screenprinted on left chest. Tagless. Machine washable. MEASUREMENT CHART in the photo gallery outlines the measurements of each size.